Pretty much everything that could be said, has been said. Let's just say that 14 years ago, when I moved to Boston as a young (but engaged) 17 year old to attend college, I knew it was a perfect fit. When I was 3, people would ask me where I was going to college (having college-age siblings causes things like that to be asked of people who can't read yet). My answer was always, "Boston." My brother went to school in Boston. 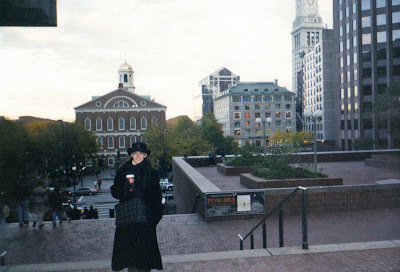 My parents took me to Boston for my dad to attend medical meetings. Sometimes we even stayed at the Copley Plaza Hotel - two blocks from the site of the explosions. Although Peter and I only spent a year in Boston, I left a bit of my heart there. Every year, we say that we need to go back for a visit (and to see friends). It's been almost 6 years since we were last in the home of the Red Sox. That's about 6 years too long, if you ask me. Boston is a town that is full of history - part of the reason I love it. People can be rude, and people can go out of their way to make you feel welcome - just like anywhere else you might live or visit. Watching the news unfold yesterday, I felt like I had been kicked in the stomach. I was a mix of emotions - ranging from angry to sad to blessed, as I watch people helping each other. When we are attacked, we stand together. It makes me want to pull out the American flag and blast Lee Greenwood from the radio. And while my heart is in New England, and my prayers go out to the people who were affected by this event... two thoughts overpower everything else. God is sovereign - He has overcome. No, that doesn't mean that we can "name it and claim it" and He will make everything bad in our lives go away. But it does mean that no matter what happens in this world, ultimately, He has overcome death for those who believe. One of my favorite verses reminds us that in this world, we will have troubles, but we are to take heart, because He (the Lord, Jesus Christ) has overcome. Let us not fix our eyes on the evilness of man or the depravity of a fallen world, but let us fix our eyes on Jesus, the author and perfecter of our faith, who, for the joy set before Him, endured the cross - so that we might live for eternity. It's not "Holy Huddle" time. Do we want the Lord to return? What Christian doesn't? But while we are here - and like it or not, we are here, in a mess - we are the "fragrance of the knowledge of Him." We are responsible for giving an answer to all who ask. We need to spend our days learning how to give that answer, and living lives that cause people to ask it. We need to be so different from the world, that the world wants to know why. It's time to stop twiddling our thumbs, waiting on the Lord to return so He can take us out of here, and it's time to start letting our light shine for Him every day UNTIL He returns. Pray for Boston. Pray for the World. Take Action Today.